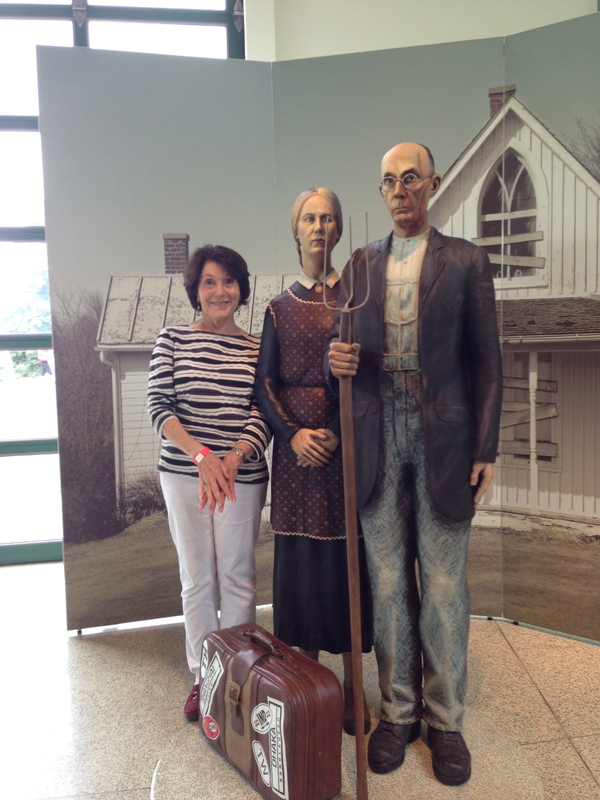 On a beautiful summer day we took an hour drive to Hamilton Township, New Jersey, to a fantastical park called “Grounds For Sculpture.’ The artist, Seward Johnson, a member of the Johnson & Johnson family, founded this park and contributed the sculptures for the public to enjoy. Some of his sculptures are whimsical. Harvey will try a hot dog anywhere! …and some use impressionist paintings as a format to place sculptures of famous artworks around the park in unexpected places. You may be walking around, enjoying the scenery, when there’s a break in the foliage. You peek in and see a famous Monet painting of a picnic scene. Further ahead is the graceful form of a seventeenth century woman by a refreshing stream. A group of Monet friends gathered at a table for dinner. They graciously invited me to join them. 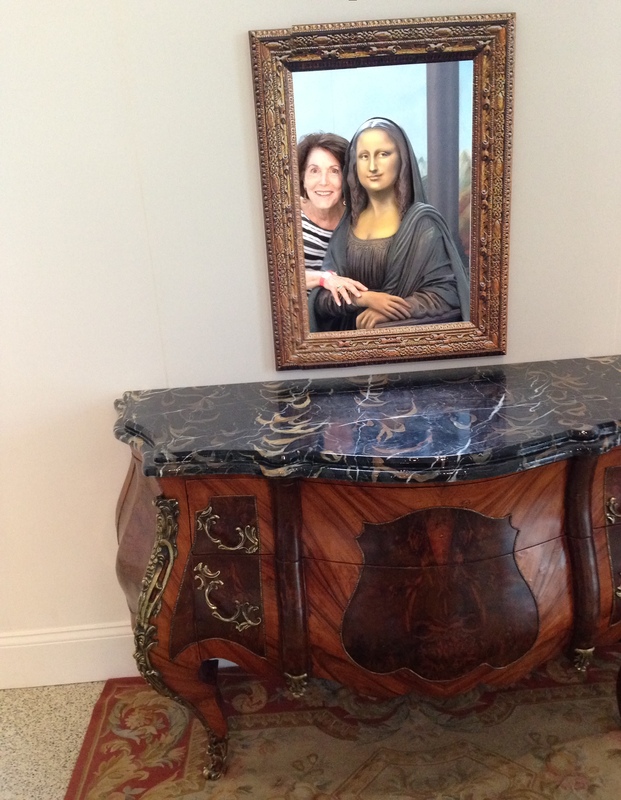 You can imagine my joy to be reunited with my friend, Mona. 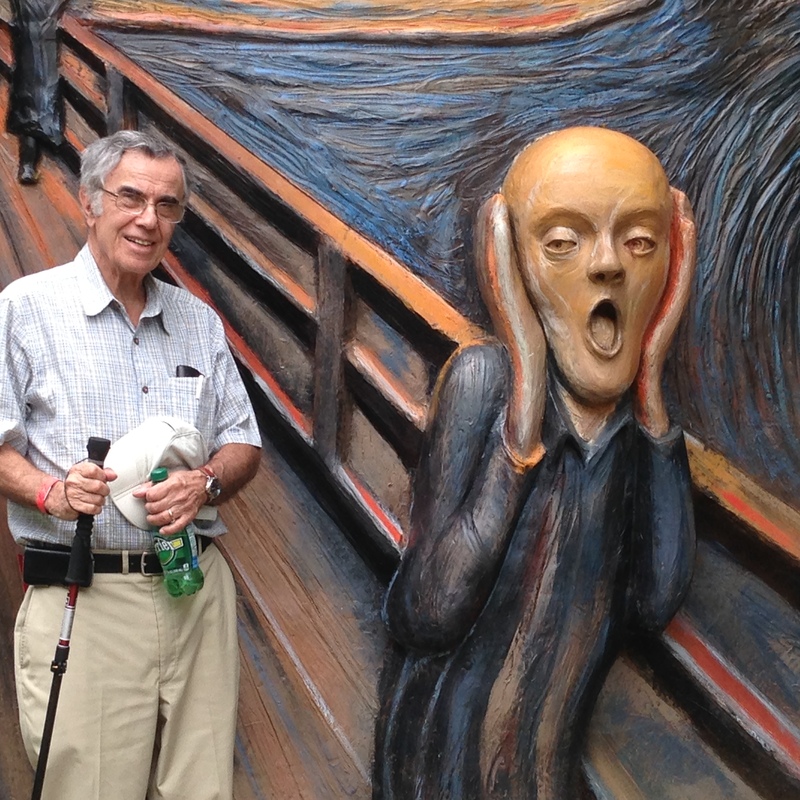 Harvey didn’t think “The Scream” was anything to get too frightened about! But it’s not all about art: don’t they realize that Grounds For Sculpture is a family park? 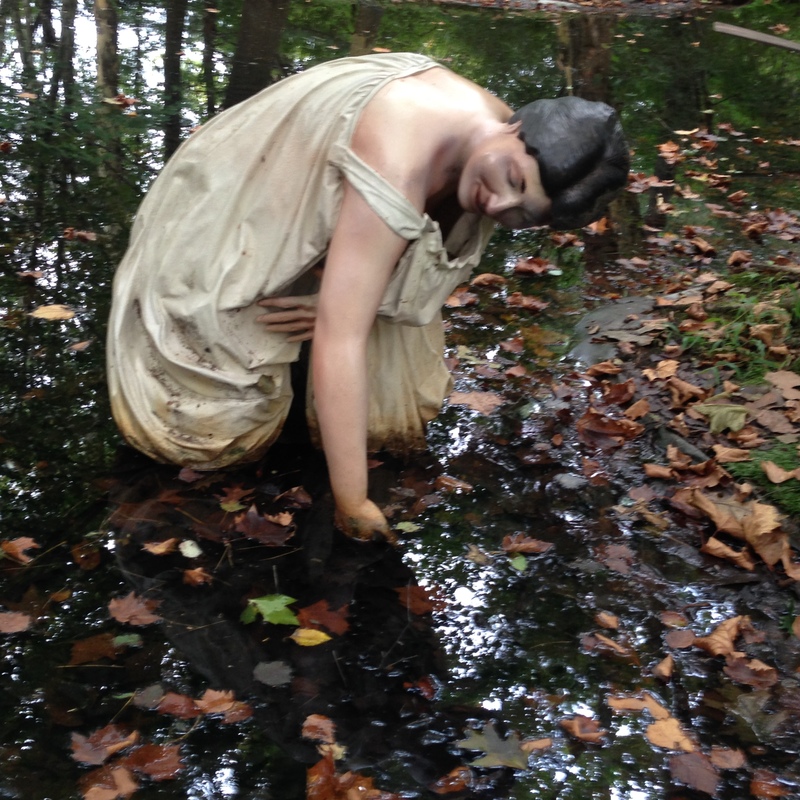 Grounds for Sculpture is a treasure. It’s one of the most unusual parks I’ve seen. Theres a wonderful restaurant on the property called “Rats.” The name is from the classic book, “The Wind in the Willows.” Worth a trip! That looks like a place I would absolutely love – thanks for the mini tour. I hope you can find yourself going there some day. My second husband was from New Jersey. 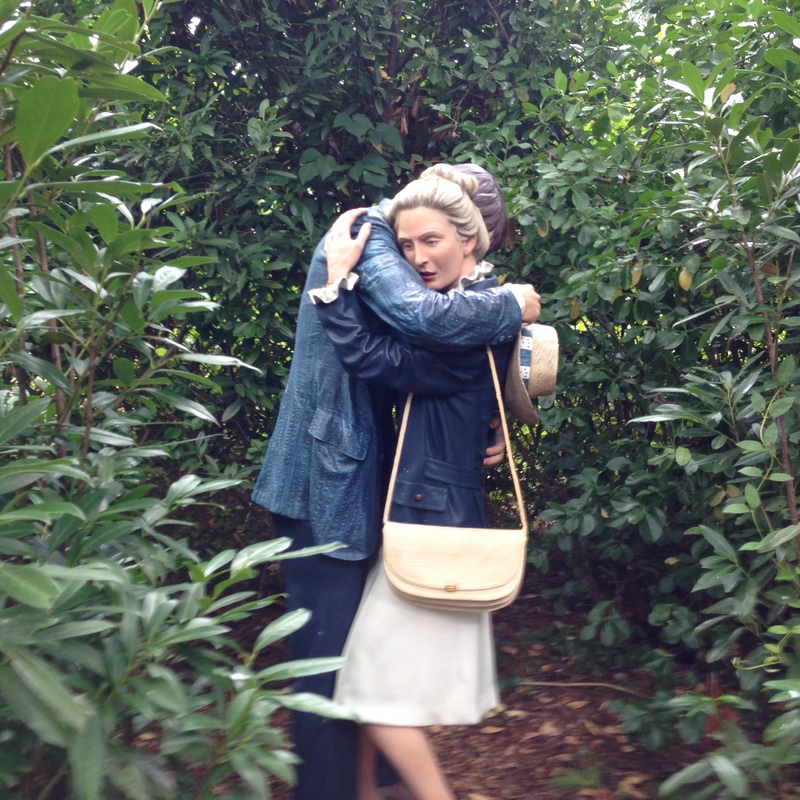 While I was married to him, we visited a number of museums. Many hidden treasures, many financed by wealthy families. I enjoyed them, but missed this park. Did get to the Wheaton Galss museum, however. Sounds very cool. I like unusual places like this. I agree; this park is a celebration of the cleverness of mankind, plus a little talent. Gotta admit, “Scream” freaks me out! Love that the two of you joined the sculptures. 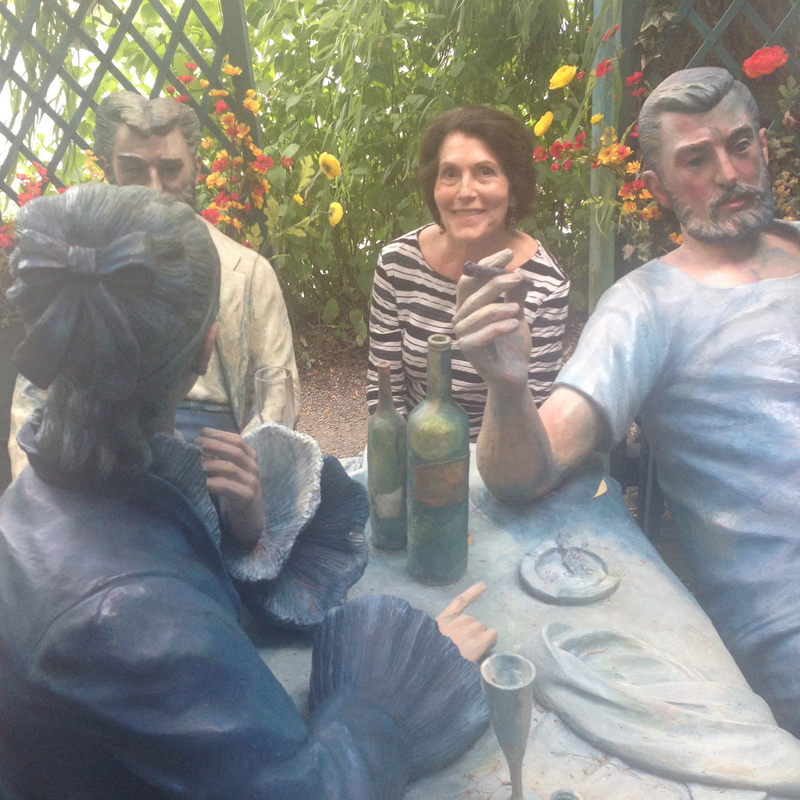 If we’d stayed there any longer Seward Johnson might have sculpted us as permanent figures in the park. Paul, it’s not far from Princeton, in Hamilton Township. I’m not an original Jersey Girl, but married into the title. This park is recommended for your next trip.The fun part is finding the sculptures, because they’re not just lined up in a row; they’re inside of shrubbery. It takes a little sleuthing to find them all. Very cool! Glad you visited! 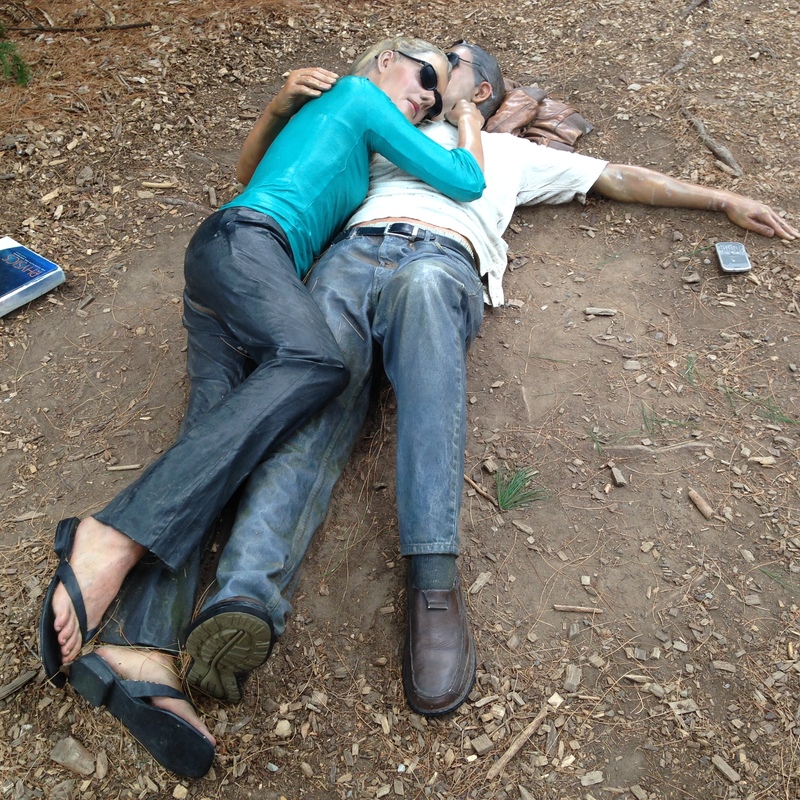 So creative for Seward Johnson to think of such a place. It’s like nothing I’ve ever seen before: fun! Thank you for reminding me of this wonderful park with your entertaining and descriptive piece. We were there about 12 or more years ago, and now plan to go back for a visit very soon. We just had to postpone our trip to New Jersey, but this will definitely be added to our list of places to see when we do go. 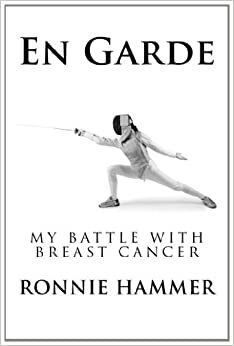 Thanks, Ronnie! Yes, it’s a treat to go. What fun! Fantastic. I can’t believe I’ve never heard of this park. Thanks for posting. Brilliant. I hope you have an opportunity to go there, Fransi. If you do be sure to make a reservation at Rats for lunch or dinner. It’s a wonderful restaurant. I will for sure. Thanks! Now that sure sounds like a place to visit. Love your photos of the place. There is a statute so life like in a place we visit that I greet it everytime we visit the place. Having you compliment MY photos is quite the fest, considering how excellent the quality of yours are. Thanks. It’s pretty funny of you to greet the statue where you visit; if it has any heart it probably smiles whenever you come by. There’s something about that place that bring out the “ham” in most people. It really is quite unique. Sure, Andrew; better check the park’s hours to be sure it’s still open by the time you get there. you are absolutely right. the hotdogs were delicious and I think they were even offering seconds at the garden party you were attending. 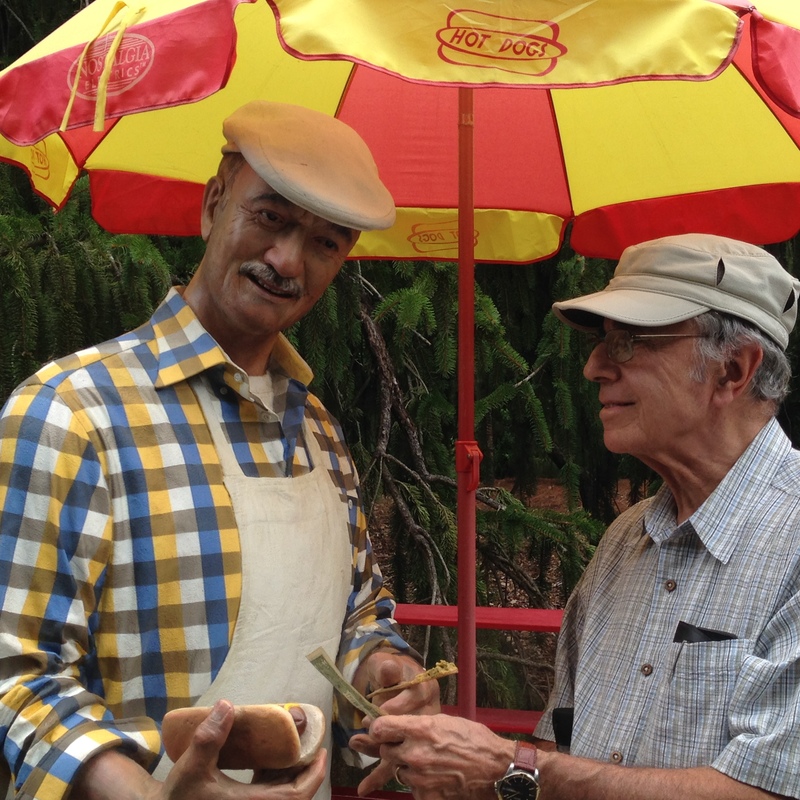 I think gastric distress was quite appropriate and the Grant wood sculptures were a reminder that “Grounds For Sculpture ” hot dogs” should remain on the grounds. Never the less, the restaurant RATS should not be associated with the lesser fare of the Sculpture Garden or with the name RATS! The reason you might have had a problem with the after effects of the hot dog is that it’s made of metal, just as the vendor is! I love that place. Yes, worth the trip.